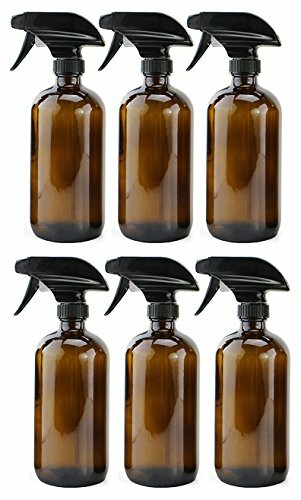 The 6 pack of 16oz amber glass BPA free bleach safe spray bottles by Cornucopia Brands allow you to safely and effectively blend, use, and store your favorite homemade aromatherapy and essential oil blends, homemade cleaning sprays, cooking and marinades, bleach, lemon water, vinegar, plant misters, cleaning solutions, the list goes on. The Cornucopia Brands amber spray bottles have a heavy duty multi-function sprayer with mist, jet stream and OFF. They hold a full 16 ounces, and are constructed of heavy duty amber glass that is very rigid and sturdy and easily withstands normal wear and tear. This is a perfect solution for any at home project that can be sprayed for cooking, cleaning, or aromatherapy! Capacity 16 ounces / 2 cups / 500 ml; size 8.5 inches tall x 2.75 inches diameter. Food safe, medical grade, lead-free glass and bpa-free plastic sprayers.